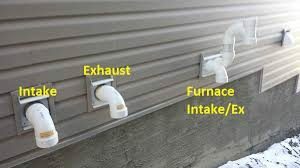 With high efficiency hot water tanks and furnaces these days the venting configuration venting has a setup similar to this picture (see photo) that typically draws fresh air in and also expels warm exhaust out the side of the home. In winter months when the weather dips down and we experience significant amounts of snow, these vents become blocked by ice/snow accumulation. These vents will need to be checked often and maintained by checking these simple steps. Look around and locate the exhaust venting. Usually it is located on the same side as your utility or mechanical room. Clear away any snow and ice buildup that may have accumulated on the vents, intake and exhaust mouths. If snow has been falling more frequently you will need to check the vents more periodically. The mouth of the venting should be clear of any ice/snow accumulation. Ensure that the mouth doesn’t have any ice buildup by the exit. Typically there should be a mesh screen installed to prevent birds, large bugs etc. from entering into the appliance. This mesh screen however can also attract frost and snow buildup which in turn can cause the appliance to starved of fresh air and may shut down the appliance! Should the your appliance shut down, refer to step 3 and refer to your manufacturer’s operational guide to reset your appliance. If you cannot locate your manual look it up online by model and make. If you have an emergency and the appliance still doesn’t power up after following these steps contact the plumbing HVAC contractor noted on the appliance sticker.